“It was indeed a moment of immense pride and pleasure when the ideas of Blind Magic Walking-stick (BMW) and Driver Alcohol Detection System (DADS) were awarded by INSPIRE MANAK SCHEME, Department of Science and Technology, Government of India. Due to the practical orientation and the resources available at Hallmark, students learn to “make” which, in turn, leads to the development of real-world applications. It is wonderful to inspire the students to take up tinkering”, expressed Kompal Arora & Mr. Apoorv, ATL Faculty. “After I saw a duplo-wheelchair model in our ATL made by Class II students, an idea struck me to create a range of comfort appliances for handicapped people especially the Blinds. The Blind Magic Walking-stick that we have modeled warns the blinds to be aware of any obstacle in their path by different sound buzzers which work on sensors. My friends- Bhavya Mittal and Viren Duggal supported me in its innovative design,” shared Armaan S. Jhand, a student of Class IX. “Once, during a discussion on community problems in ATL, we were sharing our concerns about the increased “Drink and Drive Cases”. An idea just popped into my mind to solve this problem with an enforced implementation of ‘Alcohol-free driving’…! I thought of using MQ3 sensor available in ATL which detects the alcohol level and if the person is drunk, the car engine gets locked. I thank my friends- Prabhav and Rajvansh who supported me in turning the idea into a prototype”, shared Akshat Sindhu, a Class VIII student. “Hallmarkites are nurtured to be self-driven and self-motivated to work upon specific projects to foster solutions to community problems. With ATL, we are creating a generation of Young Neoteric Innovators with the ‘Yes! I Can.’ attitude and mindset.”- Kavita Wadhwa, Principal, Hallmark. “Atal Tinkering Lab is a platform to nurture student’s curiosity, creativity, and imagination. Students love to create and explore the LEGO and Open-Source kits and innovate new prototypes.” – Mr. Jivtesh Garg, Director, Hallmark. 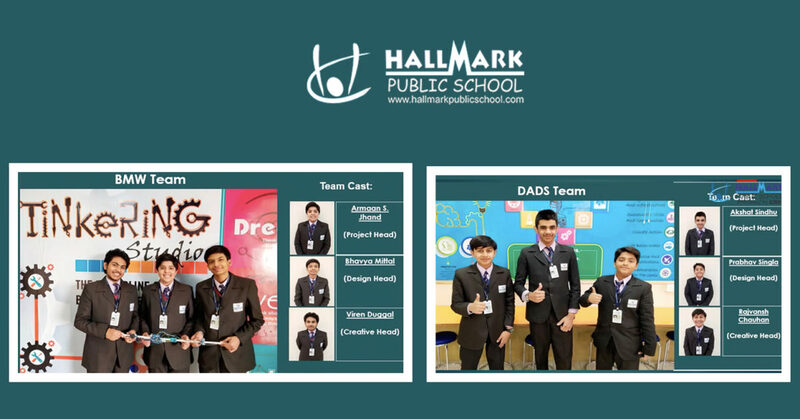 We at Hallmark Public School crowned as the Best CBSE schools in Panchkula, believe in providing a platform for students to explore and use their creativity. Atal Tinkering Lab is one such platform which enables them to think and apply their learning in a practical manner.